Jason Rawley, of Fireblade Comics, joined as Gulf Coast MakerCon last year, and made a big impression on prop-loving guests. We’re glad he’s back again this year, and asked him to tell us more about his work. JR: Jason Rawley, owner of Fireblade Comics, and I make cosplay props, both custom designs and replicas, custom action figures and display bases, scale models, and other collectibles. JR: I have been making props since elementary school, I used to help design the stage displays for school plays. I also became very interested in the FX of movies from a young age and started learning the art of kit-bashing models after seeing a special show on the behind-the-scenes of how the designers created the models for Star Trek. GCMC: Why do you think it’s important? JR: Art and crafting are important forms of self-expression and therapy. I think everyone has some creativity and needs to find a way to get it out. The cosplay community has become very popular because I think a lot of people see it as an escape, to become another character for a few hours and leave your stress at the door. JR: I will be bringing an assortment of Ghostbuster props, some action figures and display bases, scale models, and some prop guns of different genres (sci-fi, dieselpunk, steampunk, etc). JR: Look and touch (with care)! And buy if they like what they see. JR: It’s important to see in what new ways technology is being put to use, both in a creative sense and how it’s improving lives. I’m amazed to see some of the inventiveness. For example, using 3D printing technology and robotics to create artificial limbs. We are living the future now, folks. JR: What’s so great about breathing? It keeps you alive. It keeps you alive indeed! 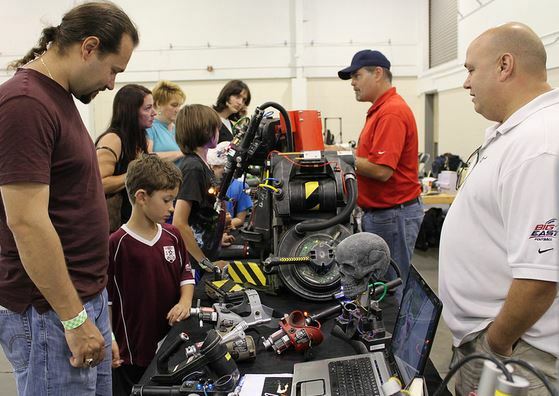 Come breathe the rarefied creative air with Jason and the rest of our great Makers at Gulf Coast MakerCon 2015 on April 18th at the Florida Fairgrounds! This entry was posted in Art, Cosplay, Costuming, Gaming, Gulf Coast MakerCon, Gulf Coast Makers Festival, MakerCon, Makers, Makers Festival, Props and tagged cosplay, Fireblade Comics, Gulf Coast MakerCon, Gulf Coast Makers Festival, Jason Rawley, MakerCon, makers festival, props. comics. Bookmark the permalink.